Enterprise systems such as enterprise resource planning (ERP), customer relationship management (CRM), supply chain management (SCM), and HR/human capital management (HCM) have promised great benefits. Few companies today can remain competitive without implementing enterprise software functionality and capabilities. For most applications, organizations no longer need to build large custom systems. Commercial software is now available for horizontal applications, such as accounting systems, ERP systems, CRM systems, and also for industry-specific systems in nearly every industry sector. However, evaluating, selecting, and implementing a new enterprise system is becoming more and more difficult. The underlying technologies are changing. Some systems look good on the surface but may not be the best fit for specific industries. Others may not provide flexibility for the future. Still others may be overkill for small and midsize businesses. Vendor viability, software reliability, and ease of implementation must also be considered. Finally, there have been many mergers and acquisitions among enterprise software vendors since the turn of the millennium, and it is not always clear whether a particular system is really part of the surviving vendor’s product road map for the future. This is especially the case when evaluating solutions from vendors that have done major acquisitions, such as Oracle, SAP, Infor, Microsoft Dynamics, Sage, Epicor, Aptean, and others. Cloud-based systems add another level of complexity to the decision. Is the vendor’s cloud ERP offering really software as a service (SaaS)? Or is it merely the vendor’s traditional on-premises ERP now offered in a hosted data center as a managed service? And, does it matter? How do cloud-only solutions, such as Salesforce.com, Workday, Oracle NetSuite, Plex, FinancialForce, Sage Intacct, and others, compare with traditional vendors offering cloud-versions of their solutions? Choosing the right enterprise system requires an organized approach: collecting operating data, building the business case, analyzing key requirements, screening vendors, and organizing demonstrations. But who has the experience, time, resources, and tools to do it right? Strativa is the right choice for independent consulting in enterprise software selection and vendor evaluation. Our process is focused and effective according to the following principles. Envisioning the future. The new system should not just replicate old ways of doing business. Our approach begins by understanding how the business is changing, what the new system must do to support it, and how the system can enable innovation and new business processes. Focus on key issues, not a lengthy RFP. In understanding your business, our software selection consultants focus on differentiators: the things that make your organization different from others and things that make enterprise software vendors different from one another. 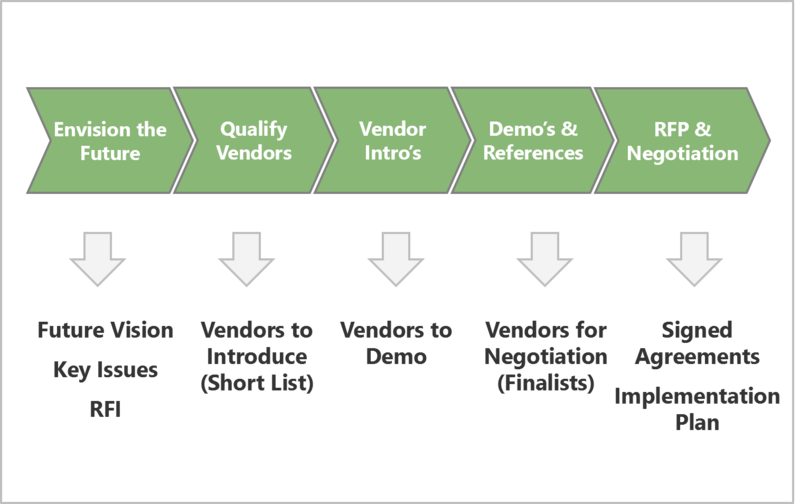 We structure these into a concise Request for Information (RFI) to use in our initial vendor qualification. The Request for Proposal (RFP) comes near the end of the process, after you’ve determined the finalists. Getting to a short list efficiently. Many buyers make the mistake of starting their software selection projects by talking to vendors. Our software selection consultants, on the other hand, shorten the list of candidate vendors in a three-step process that gets you to the right solution without taking up inordinate amounts of time from your project team. Evaluating implementation consultants as well as software vendors. Too many software projects fail, not because the customer chooses the wrong system but because the implementation consulting firm is not qualified. Our vendor introduction and reference-checking phases ensure that you not only have the right system, but the right system implementation consultants as well. Absolute and total independence. Because we do not sell software or partner with technology vendors for implementation services, our software selection consultants have the independence and objectivity necessary to give unbiased advice. We sit on your side of the table only. No conflicts of interest. Nearly all of the free “software evaluation tools” are marketing websites in disguise. They make their money by selling your contact information to vendors as sales leads. In contrast, Strativa is focused entirely on providing management consulting services. We are not in the lead generation business for vendors. Our software consulting services do not end with vendor selection. With our execution services, we can continue our engagement through implementation of the chosen system.